7. Patient can speak with a Wound Ostomy Continence (WOC) nurse to address questions/concerns. Hollister is a leading developer and manufacturer of ostomy products worldwide servicing over 90 countries. Starting in the early 1900s, Hollister began as a printer making heirloom quality birth certificates until 1948 when the company changed ownership and began making a variety of medical products such as the Ident-A band patient identification bracelet and the Disposable Footprinter for foot prints of newborn babies. In the early 1960's, Hollister moved into the ostomy products market and thrived in both ostomy and wound care industries. Now based in Libertyville, Illinois - near Chicago- Hollister continues to expand its range of medical products. 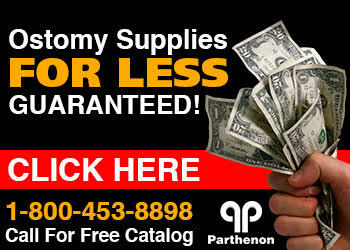 Parthenon is a family owned company that manufactures and distributes ostomy supplies all over the United States and World. Based in Salt Lake City, Utah, Parthenon is proud of its small company size enabling it to provide unrivaled customer service and ostomy products at very low prices to its customers.